The UK Food Standards Agency (FSA) has updated its list of product ranges that do not contain the six food colours associated with possible hyperactivity in young children. The FSA's list includes companies that have product ranges that have never contained the six colours as well as companies that have reformulated their product ranges to remove the colours. Product ranges that do not include these food colourings are being publicized to encourage the food industry to participate in the voluntary ban of these chemicals that was agreed by UK ministers in November 2008. However, anyone who is particularly concerned about the presence of these colours should continue to check food product labels carefully. For example, in the cases of products with a long shelf-life, the availability of reformulated products (without these colours) may vary. 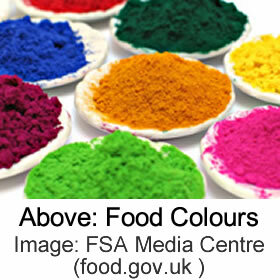 The manufacturers Frobishers Juices Ltd and Sandwich King have recently been added to the FSA's list of product ranges that do not contain these food colourings. News is included on the IvyRose website to inform visitors about current health issues, but not to endorse any particular view or activity. The views stated in the article above are not necessarily those of IvyRose Ltd.. Material in this news item was released by the UK Food Standards Agency on 2 April 2014 and may have been edited (e.g. in style, length, and/or for ease of understanding by our international readers) for inclusion here.